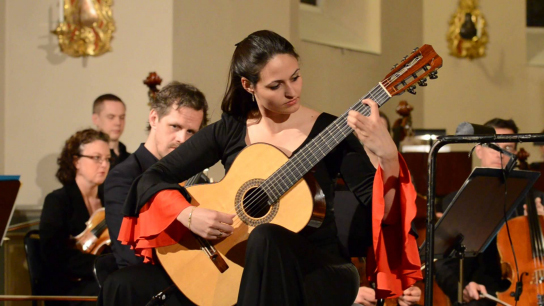 Anabel Montesinos, the youngest winner (at the age of 17 years old) of the Francisco Tárrega International Guitar Competition in Spain, is a leading figure on the classical guitar worldwide. Winner of many other major guitar contests like the Michele Pittaluga, Citá di Alessandria, in Italy and the Andrés Segovia in Spain, Anabel Montesinos has performed concerts across the world, made her Debut at the Carnegie Hall in the year 2011, performed several times at the Tchaikovsky hall in Moscow, and performed with orchestras like the Philharmonic of Turin-Italy, Philharmonic of Oulu-Finland, Havana Philharmonic -Cuba, Philharmonic of Moscow-Russia, etc. She has recorded for the label Naxos, and her first CD was chosen as a part of the music program for intercontinental flights by the British Airways. Anabel Montesinos is a Savarez Artist, performs with Cantiga Blue strings and her guitar is a Simon Marty, from Australia. She is also a Honor Citizen of the city of Solero, in Italy.